Make the most of corner space and Lazy Susan cabinets with this innovative spice organizer rack. Designed to keep your spices easy to see and access, the storage rack has 3 tiers, each with a ribbed base and raised edge to hold the spice jars in place. 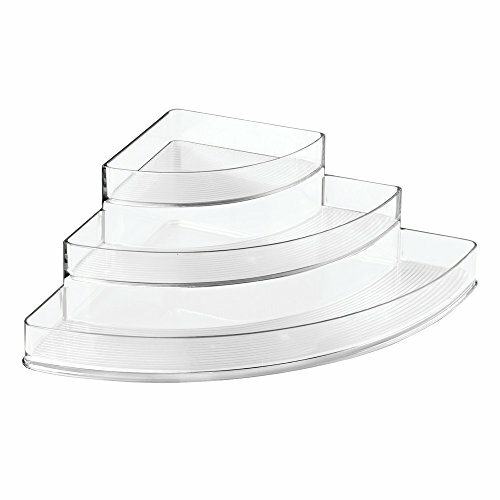 Clear plastic construction is easy to wipe clean in case of spills, and the unusual corner design is perfect for deep cabinets and unused countertop corners. Ideal for organizing herbs, spices and condiments in the kitchen, the storage organizer can also be used on the bathroom countertop to display perfumes, colognes and nail polishes, or in the vanity to store and organize medication and vitamins. InterDesign’s creative products enhance your décor, turning simple home solutions into must-have accessories that shine. Designed in the USA, we are proud to produce a wide selection of high quality home, bath and storage solutions that excite, inspire and charm. Stylish, functional and affordable, our products have been enriching customers’ homes for over 40 years. InterDesign: innovative products, exceptional value. UTILIZE CORNERS: Ideal for empty corners of deep cabinets and countertops. EASY VIEWING: 3-tiered rack keeps spices easy to see and access - measures 14" x 10" x 4". SAFE & SECURE: Organizer's ribbed base and raised rack edges prevent spices sliding or falling. LAZY SUSAN ORGANIZER: Tidy storage for herbs, spices and condiments on corner cabinet turntables.